With the introduction of minimalist ultra-light CPAP masks, it is more important than ever to reduce the dragging and pulling that is caused by traditional heavy CPAP hoses and tubing. The Slimline White High Performance 15mm CPAP Tubing with Ergonomic Cuff by Vaunn Medical is lighter and much more flexible than standard tubing, providing a more forgiving connection to your device so that it is less likely to pull the interface and disrupt the seal. The Vaunn Medical CPAP Standard Tubing is pure white in color for a less clinical (and ugly) look. It includes ergonomically designed end cuffs that are easy to grasp and remove. Made in the U.S.A. PREMIUM CONSTRUCTION 15MM CPAP TUBING- Premium Construction 15mm CPAP tubing. Made in USA. High Quality PREMIUM WHITE smooth bore interior maintains air pressure and offers maximum laminar airflow for easy breathing. The corrugated exterior and optimal center distance between each helix also maximize the tubing's flex life and integrity. IMPROVES SLEEP QUALITY - Our flexible kink-resistant tubing ensures a smooth, constant supply of airflow through the night. It also helps in the reduction of noise from the CPAP/BiPAP machine. LONG LASTING DURABILITY- Optimal center-to-center distance between each coil maximizes each tubing's flex-life and integrity. Corrugated exterior provides increased friction for effortless handling. ERGONOMIC CUFF WITH TIGHT SEAL- Uniquely designed tubing offers a firm and tight seal so it is less likely for the user to pull the interface during sleep and disrupt the seal. The smooth ergonomic cuff also allows user to easily attach or remove tube before or after each use. The corrugated exterior works to provide added friction for easy handling. 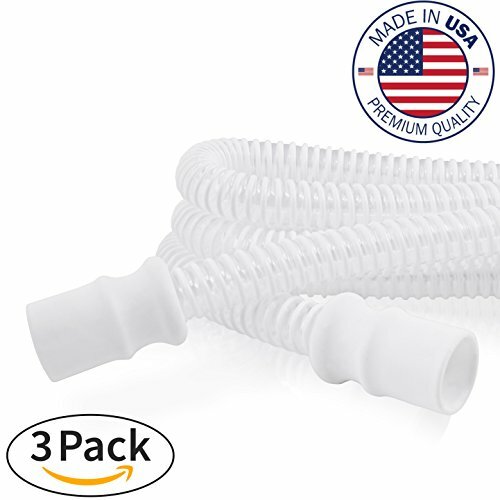 UNIVERSAL 3-PC VALUE PACK - 15mm tubing works on most leading brands' CPAP/BiPAP masks and machines i.e. Respironics, ResMed, DeVilbiss Fisher & Paykel and more. Use a sterile tube every time. Our hygienic 3-pc value pack allows users to alternate their tube after each use to help prevent unwanted bacteria and pathogen buildup. If you have any questions about this product by Vaunn, contact us by completing and submitting the form below. If you are looking for a specif part number, please include it with your message.